Right now, we’re looking ahead to the new Green Phoenix 1000 system that is just about ready to go into service here at our headquarters in Mansfield. This is a demonstration version of a small production Aquaponic system. This system is specifically designed to maximize the production capable within a 20 X 50 foot hoop house. Please check back soon for more information about this system and the other systems in the Green Phoenix series (500, 2000, and 3000). We promise that this will be a sight to see when the installation is complete and the plants start producing. So this was a frustrating week in our systems. It seems that the ants have found our beds and have declared war on us… The battles have been sporadic up until recently, with only a few casualties. (Mostly one or two ant bites as we poke through the foliage. BUT, as in every conflict…. the stakes will always escalate. On Sunday, we noticed that the ants had begun to eat away at the okra pods on one of our plants. They seemed to be burrowing into the pods and harvesting something. We responded by pruning the affected pods and disposing of them. Sadly, this seemed to have only exacerbated the issue. Confrontations with the ants became a daily issue, and the colonies seemed to be expanding with greater rapidity than before. Ultimately, this may become known as the week we lost to the ants. We attempted to stand firm in front of this invasion, and though we did win several battles, the swarm rallied and overcame our defenses. We lost a sizable portion of our harvest to their invasion – and more to the persistence of the aggressive, hungry grasshoppers! Either way, the harvest this week wouldn’t feed a family; sorry to say! As we were venting our frustration, a friend made the suggestion that we need to install bird feeders to attract the birds that will eat the grasshoppers. Does anyone have other ideas to deal with the ants? 3 great cukes – one of them a giant (Did we not notice it last week? Hmmm.) Total weight for our cucumbers was 2.8 pounds – a bonanza. We also picked 7 small tomatoes – it has just been too hot for our tender little tomato plants. Because we have been so busy with our other endeavors, we haven’t managed to get the shade cloth installed above our systems yet. Total weight: ½ pound. Peppers did better this week – do they like the heat? Our yield was 5 cayenne peppers and 3 small yellow bell peppers for a total of about ¼ pound. Okra: Again, we fear we let them get too large, but they grow so fast! Our yield was 4 for a total weight of 0.07 pounds. We still have lots of basil and some onions; as well as a good amount of mint for our tea! 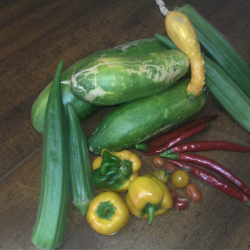 So, for this week at the end of July, our harvest was composed of a total of 20 items, weighing a total of 4.55 pounds. In the cumulative totals, that means that since we planted these systems eleven (11) weeks ago, we have harvested nearly THIRTY-FIVE (35) POUNDS of food from only 80 square feet of growing space. We hope you’ll come out and see us at our office/showroom in Mansfield – let us show you around. And let’s talk about the ways you can start growing in your own backyard. Join us in the Good Food Revolution! the ants need a predator. being part of an aquaponics setup, you might have luck getting a frog to stick around. Ants….can you find where they are coming in? Where in the ground they are originating? If you can do that, you can boil up some orange peels and whole cloves, dilute 1:1 with water and pour into the ant hill. It may need another treatment in a week or so. Or you could try DE on the point of origin. I’ve read that DE can be sprinkled on plants to discourage eating of them. Could that be used in the aquaponics system? My step dad swears that if you sprinkle coffee grounds after brewing coffee that you can chase the ants away and they will never come back to that same spot. I haven’t ever tried it, but we have a fire ant problem in my backyard, so I plan to give it a try soon. I have an essential oil spray for ants. It is made from all epa exempt and all natural ingredients. Currently in test phase at a couple of ranches and farms. I’d be happy to give some for you to try.